NASHVILLE, Tenn. – Feb. 7, 2018 – Fresh on the heels of his 2018 GRAMMY® Award win (Best Contemporary Christian Album, Chain Breaker) Zach Williams announces the Chain Breaker Spring Revival Tour, a 20-city headlining run that will also feature special guests Carrollton and Jamie Kimmett. Presented by Compassion International, the tour is set to kick off April 5, in Oklahoma City and make stops in Texas, Iowa, Illinois, Ohio, Wisconsin, Indiana, Michigan, Arkansas, Georgia and more, before wrapping up in North Carolina in early May. Williams will be touring in support of his award-winning studio project, Chain Breaker, which yielded an official RIAA gold certification for the title song and hit radio single. Holding at No. 1 for 15 weeks, "Chain Breaker" was followed by "Old Church Choir," which became the most successful Christian radio single in over a decade when it held the top spot at radio for 20 weeks, making it the second longest-running No. 1 single in Billboard's Christian radio history. Williams also made history as the first debut artist to have two back-to-back No. 1 singles. 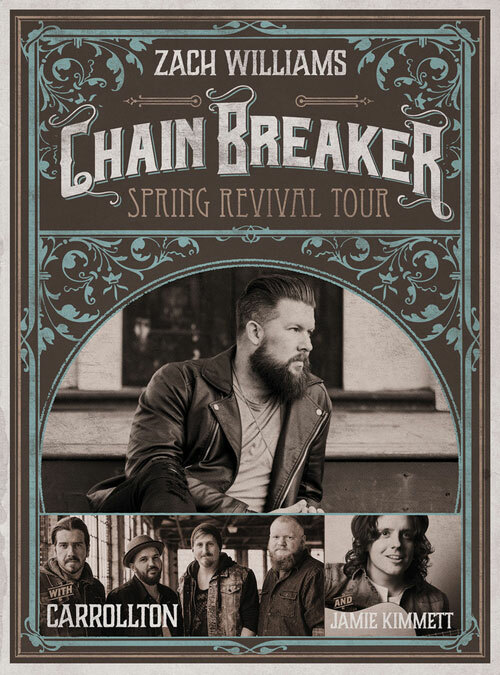 Tickets for the Chain Breaker Spring Revival Tour will be on sale to the general public beginning Friday, Feb. 9. A special VIP ticket is available in most markets which includes a pre-show artist meet & greet with Zach Williams, a signed deluxe Chain Breaker CD and a limited-edition laminated VIP pass. For details and ticket links, visit www.ZachWilliamsMusic.com. Dates, markets and venues subject to change without notice. Additional dates to be added. As a husband, father, singer, recording artist, songwriter and worship leader, GRAMMY® winner (Best Contemporary Christian Album, Chain Breaker) and GMA Dove Award winner (New Artist of the Year) Zach Williams continues to make history. Achieving two consecutive radio No. 1 hits for 35 weeks as a debut artist ("Chain Breaker," "Old Church Choir") Williams' music comes from a place of humility and honesty as his songs are a direct reflection of God's redemption in his life. "Chain Breaker" has impacted millions of people around the world, earning him his first GRAMMY® nomination (Best Contemporary Christian Music Performance/Song, 2017) and a Billboard Music Award nomination (Top Christian Song). He also won a GMA Dove Award for "Chain Breaker" as Pop/Contemporary Recorded Song of the Year and a K-LOVE Fan Award (for Breakout Single). Williams was also named Billboard's 2017 Top Christian Male Vocalist and New Artist of the Year. Apple Music chose him as Artist of the Week in December 2016, while "Chain Breaker" was the top track of 2016 on iTunes' Christian Songs chart and also reached No. 12 on Billboard's Hot Rock Songs chart. "Old Church Choir" also received national recognition thanks to a young girl feeling the spirit of the song during a performance at her church in Tennessee. At press time, the video, which can be viewed here, has received more than 53 million views. Signed to Centricity Music in 2013, Carrollton is a Christian indie-rock band known for their exceptional musicianship and powerhouse performances. Last fall they released their latest album, Everything Or Nothing, which includes the hit single "Shelter," currently at #30 on the NCA chart and climbing. In 2017 their song “Made For This” was selected by NBC Universal as a promotional anthem for the 2018 Winter Olympics and has since been picked up, as well, by Fox Sports and ESPN. Having performed alongside such artists as Lauren Daigle, Jason Gray, and Finding Favour, Carrollton headlined two tours last year and is excited to join Grammy-winner Zach Williams on tour this spring. Jamie Kimmett was born and raised on the west coast of Scotland in the working class town of Kilmarnock. As a teenager, Jamie was scouted by professional soccer team Celtic FC and was part of the Scottish national youth squad until age 16, when his father gave him a guitar and music became his passion. After graduating from music school, record labels in the US started to take notice of Jamie’s unique, soulful voice and flew him to Los Angeles. While in LA, Jamie accepted an invitation from a music associate to attend church, something he had rarely done while growing up. In that church, Jamie’s eyes were opened to the Gospel and he surrendered his life to Jesus Christ. Jamie now resides in Nashville, Tenn., and is signed to Provident Label Group (Sony Music) alongside such artists as Casting Crowns, Third Day, Matt Maher, Tenth Avenue North, Zach Williams and more. He is currently writing songs for release in 2018. For more info on Carrollton, visit the JFH Artists Database.